English translations of help-wanted advertisements in mainland Chinese newspapers might include the phrase “must be willing to eat bitterness.” This is not a mistranslation. 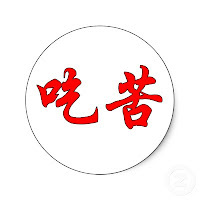 The traditional phrase“吃苦” transliterates to Chi Ku (pronounced Cheh Qwea) and translates to “eat bitter, eating bitter” or “eat bitterness.” Meanings for the phrase encompass prevailing over misfortune or in general, to be able to endure hardship. The term is familiar to students of Chinese martial arts. It can include being willing to work hard and suffer now in order to reap the benefits of one’s labor at a later time. When a prospective employer in China was asked what he meant by “must be willing to eat bitterness,” he replied "I want workers who will each do the work of two and do two days work in one." Many factories have dormitories, and dozens of rules for controlling behavior while working and not. Once upon a time, factory workers in Maynard, Massachusetts were also expected to do the work of two and do two days work in one. Much as in present-day China, workers lived in boarding houses owned by the wool mill. Expenses such as rent and meals were subtracted from their pay. Anyone unable to work due to illness or injury was fired. And evicted. Hours were long. A man’s salary was often not enough to support a family, so his wife and/or children would also work in the mill or in mill-related businesses. Children, because of their smaller size, were hired to clean and service dangerous mill machinery while it was in motion. The Assabet Manufacturing Company [1847-1898] had rules for employees. According to a 1863 poster reprinted in the book “Assabet Mills,” employees were expected to observe the Sabbath…and be temperate (not consuming alcohol) skillful and honest. Quitting workers had to give two week’s notice in order to get their last paycheck, but could be fired without notice. There was a 9:00 p.m. curfew after which workers were expected to be off the streets. The industrial revolution in the United States developed against a backdrop of a transition from labor scarcity to labor surplus. In the 1700s, as Native Americans were increasingly marginalized, the colonizing countries filled the land with emigrating religious minorities, indentured servants, convicts and slaves. Families always had enough chores on the farm to keep everyone busy. One hundred years later the inherited farmland, of fading fertility, had been divided amongst inheritors into smaller farms. Sons and daughters, now representing a labor surplus, sought factory work in cities. Immigrants, too, came to America to take on any hardship as better than the hopeless, wretched life left behind. The town of Maynard saw influxes of Irish, French-speaking Canadians, Finns, Russians, Jews, Italians, Poles and other immigrants. Many of them accepted horrible working conditions in the hope that life would be better for their children. For example, in 1912, Maynard’s male mill workers were making 11 to 16 cents per hour, and were pressing owners to reduce the work week to 54 hours – five 10-hour weekdays and only a half-day on Saturdays. This when a new Ford Model T automobile cost $690. Women and males under the age of 18 were working “only” ten hour shifts (for less pay per hour) because their workday had been set by the Massachusetts Ten-Hour Act of 1874. Americans have to some degree lost the willingness to “eat bitterness.” Instead, many think that mysterious “laws” of attraction, manifestation, abundance and prosperity will reward us with the materials of wealth and health if we just visualize them with enough clarity. An internet search on the term "laws of abundance" finds thousands upon thousands of hits. But in the real world, if a person does not "eat bitterness" they will find that "someone else is eating their lunch" (taking their share of prosperity).